Monster Media has announced a partnership with Cemusa to bring interactive digital advertising to a network of eight digital newsstands in Times Square in New York City. The street-level screens are embedded into kiosks where people buy their daily newspapers and magazines, giving advertisers a powerful location to reach coveted on-the-go target audiences in the popular tourist and business destination. Cemusa, which already has the digital displays in place, is a leader in the design, manufacturing, installation and maintenance of award-winning street furniture. The company operates more than 110,000 structures in 110 cities around the world. The digital newsstands will employ Monster Media's interactive capabilities to go beyond passive screen advertising, which is already ubiquitous in Times Square. Advertisers will be able to run campaigns that utilize touch interactivity, gesture-based activation, photo/video capture and gaming in order to engage audiences and immerse them within an advertising campaign. Use of cross-platform integration will also be available, such as mobile interactivity, SMS shortcodes and email campaigns in order to connect with viewers even after they've left the newsstand. Monster Media's proprietary back-end analytics platform will provide advertisers with the critical data they need to make decisions about campaigns. The platform goes beyond traditional traffic estimations, with the ability to record interactions of all types, time-of-day data, impressions and more. According to the Traffic Audit Bureau (TAB), these units generate an average of over 500,000 impressions per week. "We are so excited about the enhanced communication possibilities that this initiative provides to our advertising partners," said Nigel Emery, Vice President of Marketing and Business Development at Cemusa. "Bringing interactive advertising to Times Square offers another innovative way for advertisers to get their message out at the crossroads of the world." "Times Square can be one of the most powerful advertising locations in the U.S.," said Chris Beauchamp, CEO of Monster Media. "Whether the intention is to influence the buying decision or build a brand, the digital newsstand network will allow advertisers to reach their audiences like never before in arguably the country's busiest advertising market." 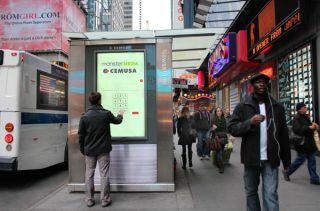 The Times Square interactive digital newsstand network from Cemusa and Monster Media will go live in April 2012.